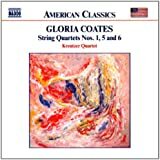 Écoutez Coates, G.: String Quartets Nos. 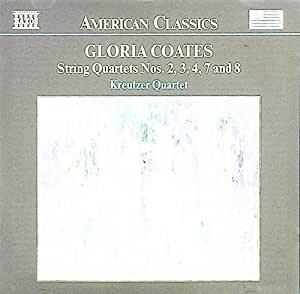 2-4, 7 & 8 par Kreutzer Quartet et des dizaines de millions d'autres titres sur tous vos appareils avec Amazon Music Unlimited. String Quartet No. 7, "Angels"
Coates is fond of using Baroque analogies to cast her work in technical terms, and in interviews openly confesses her love for Vivaldi and Bach. While there's little doubt of her meticulous attention to formal structures, make no mistake--Coates would be burned as a witch had she produced works like these in the 18th century. Not to be flip, but the discerning eye will note in most portraits of Julian Bream a subtle protest: fingers forming the "devil's 9th" chord, the playing of which was punishable by death during the Inquisition and afterward. This somewhat dissonant chord is clearly visible on the cover of his arrangements of Bach's partitas. Coates incorporates a vast vocabulary of dissonances into her rarified soundworld--one at odds with much of modernist orthodoxy (which the moderns have long since morphed into) for its sheer emotional heft and technical complexity. She sounds nothing like Vivaldi; for that matter, she sounds nothing like any composer. If one is pressed for comparisons, her music bears passing resemblance to Feldman, and then only in the vaguest terms. The simplistic view would be to call her quartets and symphonies scores for approaching flight paths--what airports sound like on the outside from fixed positions, a soupcon of colliding Doppler fades and crescendos. More directly, though, the listener finds a smoldering core of mournful, ambivalent glissandi that cascade over one in a torrent. Like most 20th-century iconoclasts, she favors strings over horns, woodwinds and percussion, and the utilization of large banks of violins, violas and cellos in her orchestral work gives it unprecedented scale. This characteristic follows with her chamber music as well, and it must be noted that any ensemble playing Coates must do so with a sense of this multiplicity. This offering is clearly among the best.